Anaheim’s conflicted planning is ruining the opportunity to create a dense urban village, high-speed-rail-friendly for tourists, sports fans, and 25,000 new residents. An interesting study for the future of urban development in the United States is Anaheim, California, where bullet trains might one day connect with San Francisco and Las Vegas, in the shadow of The Disneyland Resort, Angel Stadium, Honda Center, and Anaheim Convention Center. Orange County, once a bedroom suburb to Los Angeles, has come of age with 3.1 million residents, where according to the New York Times nearly half of them speak a language other than English, including whole neighborhoods with predominantly Latino, Vietnamese, Korean and Chinese households. Because of high land values, the need for affordable housing has skyrocketed, along with the insatiable demand for walkable communities with parkland and alternative transportation modalities. Tens of billions of dollars will be invested into the first high speed rail (HSR) project to terminate in Anaheim which, following the example of Japan and Europe, has the potential to facilitate high quality urban environments. As well, developing a high-density transit-oriented village servicing several significant tourist and sports attractions will help California meet the AB 32 and SB 375 climate change goals of reducing greenhouse gas emissions by reducing automobile and air travel. The potential for HSR to reshape growth in California was documented in a recent study by SPUR, which recommends significant transit-oriented development zones at proposed stations to ensure municipalities fully benefit from their new connections with distant regions of the state. Anaheim has a master plan, but unfortunately, because of a skewed planning process led by vision-compromised politicians, this significant opportunity might be missed. The City’s most well-intentioned prescriptions could create a post-automobile sustainable transit village, as well as a community for our 21st Century demographic melange. Unfortunately, the presently approved design may only amount to a few high-density condos separated by a freeway from an oversized train station in the middle of a faceless suburban sprawl of six-lane arterials, parking lots, and missed opportunities. 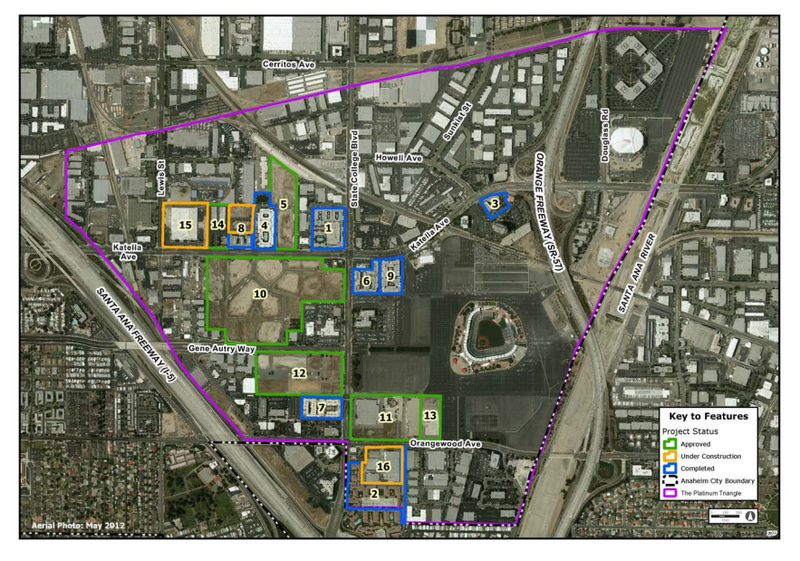 Consider the 820-acre Platinum Triangle Expansion Project, near Angel Stadium and the 5 and 57 Freeways. It calls for transit-oriented condominiums and apartments, homes for possibly 25,000 new residents, built over shops and restaurants, amid high-rise offices just across the freeway from Disneyland-California Adventure resort district. The plan envisions a new downtown OC, where train-commuters and residents could walk to offices and shops, and sports fans, concert-goers, and theme park guests could celebrate in nearby entertainment venues. The General Plan Designations Map of Anaheim Platinum Triangle illustrates mixed-use development districts where the Santa Ana Freeway (I-5) and the Orange Freeway (SR 57) converge near Angel Stadium. Development districts include Katella, Gene Autry, Gateway, Arena, ARTIC Rail Station, and Stadium. Proposed:18,909 residential units, 4.9 million square feet of commercial space, and 14.3 million square feet of office space. Other districts are office high density, office low density, and industrial and institutional zoning classification districts under Platinum Triangle Land-Use Plan. This expansion of the plan was recently approved by the city council 3-2 with outgoing dynamo Mayor Curt Pringle’s intense boosterism. Mayor Pringle has been a one-man-show of potentially conflicting roles in creating this vision for Anaheim. He has served three years as Board Member of the California High Speed Rail Authority (CHSRA) shepherding forward the state’s most important infrastructure project in half a century; in a controversial move, he has been recently reappointed to the post as one of Governor Schwarzenegger’s last official acts. As well, he has just finished five years on the Orange County Transportation Authority (OCTA), keeping the local and regional traffic flowing, in addition to eight years of city council decisions deemed “freedom-friendly” by the often-libertarian-leaning Orange County Register. All of this in addition to catering to private-sector real estate and construction clients in his day-job as government affairs consultant for Curt Pringle and Associates. His affable, entrepreneurial style has energized alternative transportation and transit-oriented development in OC, but consider the cross-purposes and lost possibilities inherent in the Chairman-Mayor-For Hire decision-making model. Recently the Attorney General’s office concluded Pringle improperly held his mayoral and rail-board chairman offices, described as “incompatible.” Under examination was a request to fund the Anaheim Regional Transportation Intermodal Center (ARTIC) with an additional $200 million of state HSR funds to redesign the already $184 million station to receive bullet trains someday from San Francisco and Las Vegas. The voter-approved legislation creating the HSR Authority leaves funding of individual stations in a gray area. To make matters worse, board members of the OCTA have questioned whether ARTIC is eligible to receive about $99 million of the already earmarked funds from the county half-cent sales tax called Measure M. Whether ARTIC will ever receive high speed rail trains is in question. Consider the further problems with ARTIC. First, in order to get HSR there on dedicated tracks (not sharing with Amtrak and Metrolink), it necessitates a tunnel under the 57 off the existing rail lines, a complicated and expensive proposition. Sharing tracks with the slower commuter lines could work but at slower speeds. There are those that argue HSR works between Los Angeles and San Francisco, but is not highly achievable sharing busy urban tracks with freight and commuters, and where expanding new lines with grade separations and tunnels are expensive and often impossible. Second, the station is located across the freeway from the Platinum Triangle, which means it is NOT pedestrian-oriented for baseball fans, residents, or employees in the district, and at best could be used for a brisk walk to a Ducks hockey game or a concert at Honda Center. The reason this piece of land was chosen for ARTIC was that Anaheim owned part of this land and OCTA bought an adjoining piece; a short-sighted self-interested reason for planning something that may doom the entire undertaking. The station must be in walking distance to the center of the district as well as the main attraction: Angel’s Stadium. No one will cross a freeway on foot, and necessitating a “fixed guideway” or shuttle ride will significantly reduce its usability. Understand that rail stations should not be designed like airports, surrounded by access roads and parking, and should avoid the fate of BART Stations in the Bay Area that discouraged ridership through limiting development NEXT to the stations. Anaheim must emulate New York City’s Grand Central and Pennsylvania Stations and Paris Nord, the essence of intermodal urbanism. Unfortunately, ARTIC threatens to emulate Los Angeles’s Union Station failure, located on the wrong side of the Hollywood (101) Freeway for downtown connections. The role of mayor advocating for local land use and financial interests was clearly incompatible here with the HSR Chairman making the hard choices to contain costs of a $43 billion infrastructure project impacting properties, constituencies, and resources across the state. Evidently, in re-appointing Pringle to the Authority Board, Governor Schwarzenegger did not consider this an issue, but the inconsistencies remain, the ARTIC location a serious deal-killer. CHSRA Chairman Pringle’s private-sector clients with conflicting interests in the high speed rail project as shown by the LA Times were: Vulcan Materials (sand and gravel operations and railroad right-of-way interests), Teichert Inc (heavy construction firm), and City of Industry (freight rail interests). Pringle should be made to renounce these conflicts immediately or be revoked from the Authority Board. Back to the Platinum Triangle design, Pringle’s last major vote on the Council toward creating this new Downtown OC avoided committing to state-mandated affordable housing requirements that have determined a need for almost 4,000 units for moderate- and low-incomes. The PT plan did allow for minimal park and open space designations, but hardly created enough space for the thousands of new residents with no backyard or dog-walking opportunities. No new schools were planned, asserting that mainly single people and seniors would be cohabitating there, but reality will call for several schools to be built in areas where none of these future students will be able to walk to. And little attention was paid to district walkability, so vital to success of comparable “smart-growth” stadium-downtown’s like San Diego’s Gaslamp Quarter adjacent to Petco Park. Did a big city mayor approve this project, or real estate consultant? Green stormwater infrastructure and the project’s proximity to the Santa Ana River were overlooked as open space design opportunities. Renewable energy generation, green roofs, incentivize Leadership in Environmental and Energy Design (LEED) structures and bettering Title 24 codes were only mentioned as suggestions. The developers created a master plan based on otherworldly optimism about the proliferation of luxury condominiums, brushing off traffic, climate, and energy concerns, and rubber stamped by city planners. Then Pringle’s council fast-tracked it (approved 3-2), ignoring the parade of letters and testimony from local residents, neighborhood groups, and community organizations demanding smart growth designed with attention toward equity, affordability, human health, sustainable energy, green technology, water, parks, and access to jobs. San Francisco’s Bayview-Hunters Point, an analogous 700-acre redevelopment, was approved with developer Lennar Corp. including a Community Benefits Agreement requiring 32 percent of housing units built affordable, with $27 million in housing assistance and $8.5 million in job training funds for neighborhood residents. Interestingly, Lennar is one of the Platinum Triangle developers and a former Pringle client. Via Verde, an intensive redevelopment in New York City’s South Bronx was approved with an amazing array of green roofs, urban agricultural fields, and parks allowing community events and recreation: not just a bunch of high rise buildings stuffed into a confined area. Portland’s South Waterfront redevelopment created a 20 acre greenway consisting of trails and open space, controlling all water runoff protecting salmon in the Willamette River. The point is responsible governmental leadership with community involvement creates a thriving urban village, sustainably meeting the needs of people and natural systems, while earning significant returns for developers and tax revenues for their cities. This is a great piece, Jack. Nicely done. I don’t understand why someone doesn’t just hire you to fix LA! You’ve got all the right answers. Outstanding piece Jack!! You nailed it!